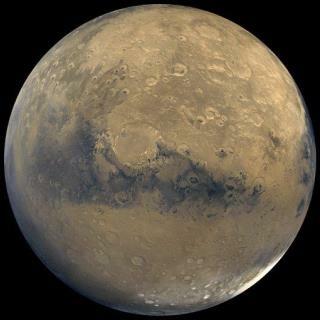 (Newser) – NASA made its much-hyped big announcement today, and what it comes down to is that scientists have found the strongest evidence yet that there's liquid water on the Red Planet, the Washington Post reports. Last April, using data from the Curiosity rover, researchers noted that perchlorates were present on the planet. Those are a type of salt, and they could make the boiling point of water on Mars—which is extremely low thanks to low pressure on the planet—much higher, which would mean that liquid water containing perchlorates could form during certain parts of the year. It's been theorized that such water could be responsible for forming the geographic features known as recurring slope lineae (RSL) that have often been seen on Mars. Researchers have been looking at RSL features and found lots of perchlorates that appear to have been getting hydrated. Of what use is mars? Saltwater ponds were easily visible down there as early as 2001. Just run mars brine ponds through Google.